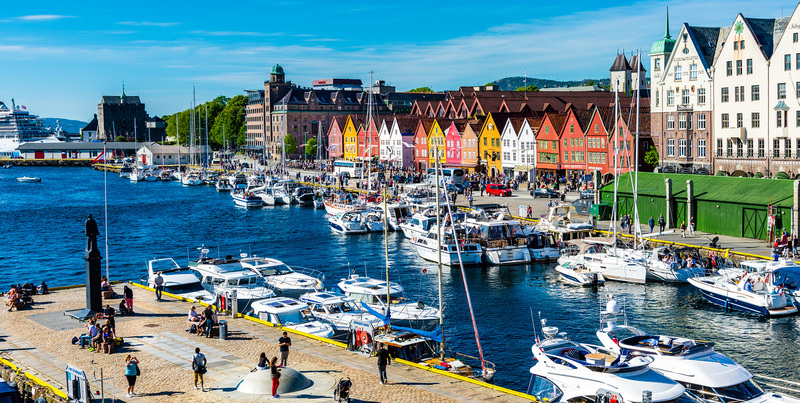 The amenity centre for pleasure-craft visitors is located on the 1st floor of the Zachariasbryggen building (entrance from the fish market), and has toilet facilities, washbasins, showers, washing machines, and tumble driers. After 8 pm, visitors may use the ground-floor toilets at Zachariasbryggen. A valid harbour-dues receipt is required to access the facilities. Children must be accompanied by an adult. Access code for the amenity centre can be found under “Information on Port of Bergen” on the GoMarina app. This code is also specified on your harbour dues receipt, or can be obtained by contacting the harbour guard on mobile no. +47 959 89 978 or tel. no. +47 55 56 89 80. A card payment machine for harbour dues and electricity is located at Torgutstikkeren (Shetlands-Larsens Brygge). Harbour dues can also be paid using the GoMarina app, but this does not apply to electricity. Electric hook-up points are available at Bryggen (16A), Torgutstikkeren (10A), and Blomstertorget (16A). Access to electricity is charged at NOK 80 + VAT per 24-hour period. NB! To access electricity, you have to use the machine and pay your harbour dues and electricity at the same time. Electricity can only be paid for together with the harbour dues. If you pay harbour dues via the app, you will have to pay once more if you later decide to use electricity. Fresh potable water is available at Torgutstikkeren and at Bryggen. Water is included in the mooring fee. In winter, you can top up with water at Munkebryggen, where diesel is also available. Waste containers are provided at Torgutstikkeren and at Bryggen. A chemical waste disposal point can be found in the bay between Holbergskaien and Munkebryggen. The facility usually opens at Easter and remains available until October. A recycling station for hazardous waste can be found at Munkebryggen. Water and fire points, along with a number of fire extinguishers, are provided along Bryggen and Torgutstikkeren. We kindly ask that the public/boat owners respect the purpose of this equipment, and use water hoses for water filling and fire hoses and extinguishers for fire/ fire incidents only. Free WiFi/internet access is available at the Tourist Information Office. GC Rieber Eiendom offers private mooring at Marineholmen, and can be contacted on tel. +47 913 31 350. Find more information here.